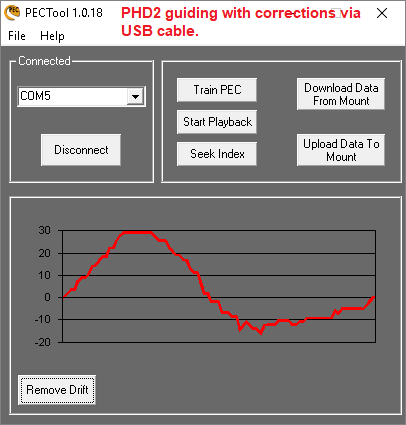 - start PEC recording via the handset (or PEC Tool). I recently downloaded PEC Tool and trained the PEC on my AVX. My results were pretty great. Last night I guided several hours under 1 arcsec total error with PHD2. Training PEC was a big part of the improvement I've made. PEC Tool totally automates finding the index, making training runs, averaging them and loading the result into your mount. The only downside was having to find a cable to do ST4 guiding. 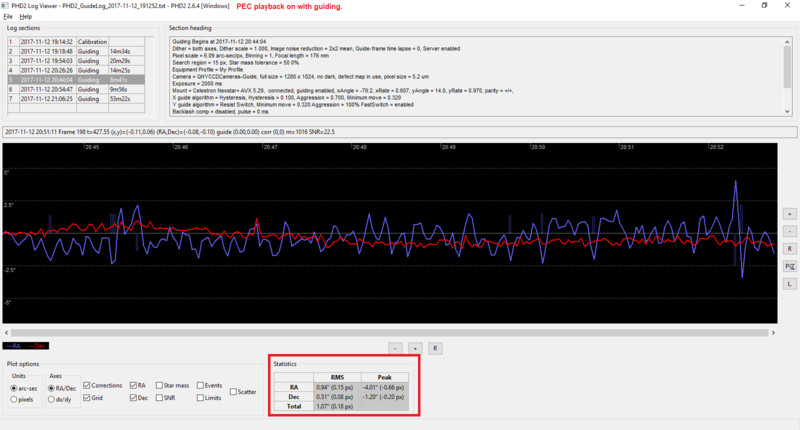 Unfortunately, PEC Tool does not allow pulse guiding. Still, that is a small deal if you have a guiding cable and way better than using the PEC training function in the handset. BTW--If you are running Windows 10, you will have to install PECtool in compatibility mode. Glad to hear it works well! I don't understand why a ST4 cable is needed... PHD2 sends the corrections to the mount and the mount records them, so why does the mount need a direct connection via a ST4 cable to the guide camera? How many runs do you need to get a good average? What's the amplitude of your mount's PE before correction? 1. You have to be able to connect both your mount and guide cam to the com port on your PC. You need a hub like ASCOM to do this. I believe Nexremote may do it, but otherwise you can use a ST4 cable for the guide cam to the mount and your com port through a USB to your mount. 2. I used 5 runs and got good results. Others may use more. 3. My before PE was about 38 arcsec P-P. With PEC, about 26 arcsec P-P. My improvements in total RMS error came from a combination of this, removing backlash in my DEC gearing and making changes in PHD2 settings. Yes, I ran my autoguider for about 20 minutes prior to training, though I doubt that much time is really necessary. Just make sure your guiding graph shows parallel trend lines and your guiding curves have settled somewhat. Any initial imperfections will averaged out. You can watch resultant curve after each iteration of training to see whether or not any sample is far different than the others. Mine all looked very similar, so I was not concerned about averaging an outlier. Also, I chose a star near the celestial equator, but several (15-20) degrees from the meridian. I had a play with PEC on my AVX mount and it seems to help. The PE has a range of 40" and I only did one training run. 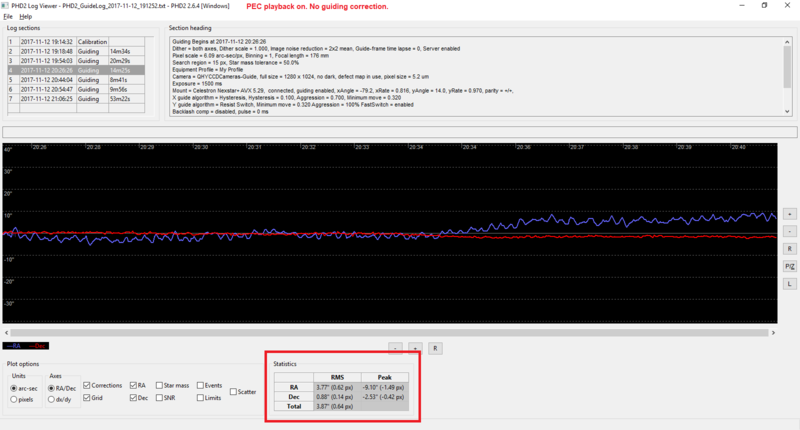 Guiding with PEC playback was an improvement, PHD2 makes less corrections. I will add more training runs in the future. Connect your mount in the usual way via Ascom to the bottom of your hand controller. Next, start Nexremote, configure the virtual port to something like "6". Next, start phd, go to the Ascom properties next to the connect button in Phd and change the Com number to the virtual port you configured. Click "connect". Now start Celestron's Pectool and connect to "Nexremote". You should now be connected to all 3. The only draw back is you have to do your star align using Nexremote. You don't need goto accuracy to do this so a 1 star align is good enough or you can simply sync on a known star. This will at least give you a pointing model. After this is done and you're tracking, DO NOT USE THE HAND CONTROLLER. It seriously confuses the mount and you'll possibly lose your alignment. You should now be ready to start. First make sure you find the index with PecTool before you select a star and start guiding. If I recall, you can use the Advance GT for the mount in Nextremote and the latest firmware. Select your number of runs in PecTool, start recording and head for the house. The worm period for the AVX is 600 seconds or 10 minutes. I tried NexRemote in the past but it never gave me a GUI that was like the handset, so I left it. But yeah too many apps fighting for that COM port! I started the PEC recording from the handset, it seemed simplest. I listened to the voices saying PEC was not needed if auto guiding. I recently came across a blog post from Unk Rod disputing that, so gave it a try. I used 5 training runs and let PECtool average and load them into my AVX. My results were similar. 2 nights ago, I imaged for 3 hours below 1 arc sec with many long stretches between .65 and .88 arc sec. AVXs are capable of decent results with some work and patience. There are plenty of PEC naysayers out there but I doubted their "well, you have to guide anyway even with PEC so why bother?" argument. It only took 30 minutes to try out PEC before I was convinced it makes a difference. Looking at the actual PEC values in the downloaded file I'm surprised to see the exact same value for up to a minute...? Any ideas? My assumption would be that is a period where Your PE is smooth and consistent. My mount has similar periods. Edited by ChristopherL, 15 November 2017 - 08:21 AM. Thank you, ChristopherL for sharing your thoughts and experience. Now I am going to have to find out if I can use the PECTool on my ASGT... I like your result and would love to try to replicate it. Okay it's not for everyone. But...I'm a little confused about the GUI? Nexremote displays a hand controller nearly identical to your original HC on your pc. You use it just like your original HC and it has most of the same functions including ASPA. Other software is installed along with Nextemote is it possible you're confusing Nexremote with one of the other's? Pretty sure it was NexRemote I used. How did you record the error without sending corrections?? How do you not send the corrections? First of all I'd like to point out that PEC training on the AVX does not require any program at all unless you want to average the data of several worm cycles. When turning PEC on the mount starts moving RA until the worm index is found, so no need to wait for one cycle. Great discussion about the software here, but it seems like all overlook the basics! Did anyone post a comment about what star to use? Next to the celestrial equator, at a dec near 0° is the answer and in the south because it should be high in the sky. UK is pretty much in the north, so a higher dec might be better. You should select one 30° above the horizon at least what ever dec you end up at your location. You should also check if the air is calm and the stars are not twinkling too much. For the first attempt I would use the mount controller and select teach PEC there. After some 10-20 minutes it will say "Done". Auto guide as you always do. If that is with PHD2 and a computer it is fine, if it is with an autogider it is also fine. As always check the result! To avoid any software confusion there is an old school procedure for this as well: polar align your mount and then intentionally change az by about 1°, that is twice the radius of the polar scope circle if you have one. Now set your camera to lowese gain/ISO 100, add a NB or ND filter if you have and take an unguided 30 minute shot with PEC on and one with PEC off with one very bright star in the image. The star will drift up or down and the trail is your PE curve. Take a sharp and guided shot for plate solving to determine the scale. I did autoguiding and PEC enabled and it helps. Reason being, the PEC know what is coming up next and correcting right in time while guiding is always correcting what as already gone wrong. Using software and averaging curves for an AVX is really waste of time. The mechanics of this mount is poor and each turn of the worm will be different because the big gear is also uneven. Unless you have extremly low polar error the dec axis needs corrections as well and the famous stiction of the bushings (not bearings) in the dec will ruin it all plus the backlash will ruin any image near the zenith. I have been fighting the shortcomings of that mount for a year and now added little money to upgrade to the EQ6-R frankly admiting what a fool I was investing so much time in the AVX. You learn a lot but you won't tune this mount to decency level.